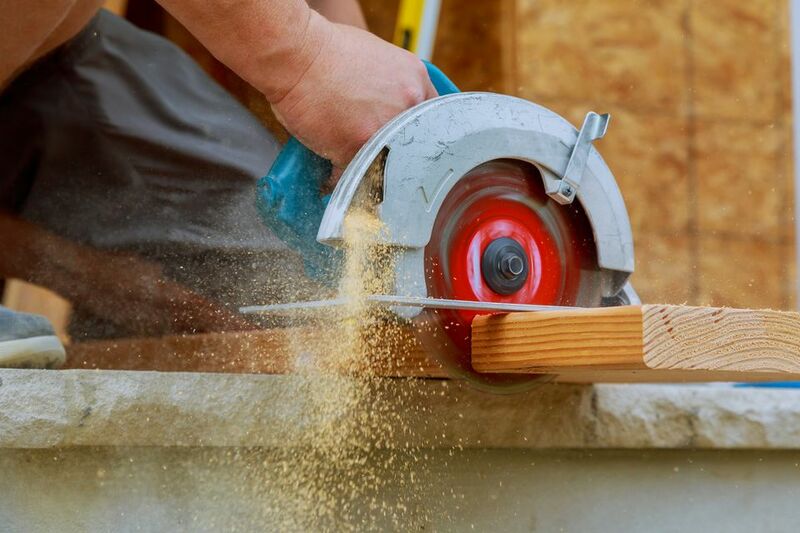 Circular saws are a staple of construction sites, as they are one of the most useful and versatile home building power tools, but there are also plenty of uses for a circular saw in fine woodworking. For instance, a circular saw and a straight edge can be used to cut sheet goods like plywood just as accurately (and likely more conveniently) as a table saw. A circular saw can be used to cut grooves for cleaning out a half lap joint as well as making crosscuts or angled cuts much like a miter saw. Using a circular saw safely and accurately takes some practice. Contrary to a straight drive circular saw, a worm drive saw uses a set of gears to connect the saw blade arbor to the motor. The worm drive saw is much longer in length than the boxy straight drive model, and the saw blade is on the left side of the saw's body, which gives right-handed operators a much more clear view of the saw blade as it engages the cut line. The trigger handle is much lower and more behind the motor on a worm drive saw than on a conventional straight drive model, meaning that the saw should be held more out in front of the operator than from above. This position of the trigger handle makes it easier to cut sheet goods by freehand with a worm drive saw, as the natural motion is to move forward with the cut hand rather than pushing the saw along from the top with a conventional straight drive model. In either case, you'll want to have some time to practice making cuts with either type of saw before attempting to make any accurate freehand cuts. If you're left-handed, cutting with a worm drive saw can be particularly challenging, because the rearward position of the trigger handle isn't conducive for leaning over the saw to see the saw blade engaging the cut line. If you're considering purchasing a worm drive circular saw, know that the cost for this type of model is usually about double the price of a straight drive circular saw. For many woodworkers, the difference in price is worth the investment, whether that be because of the easier view of the blade on the cut line for right-handed operators or because of the position of the handle. Either type of saw can be used to make the same types of cuts, so it is simply a matter of preference and getting comfortable with using the chosen model. Both the straight drive model and the worm drive can be purchased with up to a 15-amp motor depending on the manufacturer, but the worm drive has the advantage of being able to use spiral gears to provide more torque to the saw blade, which can help to power the saw through tough cuts where the straight drive model might bog down.